Both teams meeting in Cleveland on October 1, 1978 were missing key personnel and coming off losses the previous week. The visiting Houston Oilers were without star rookie RB Earl Campbell, who was sidelined by a pulled hamstring, and WR Billy “White Shoes” Johnson, the outstanding kick returner who had gone down with a knee injury. Head Coach Bum Phillips’ team was 2-2 after a low-scoring loss to the Rams and still had a potent defense while QB Dan Pastorini continued to direct the ball-control offense. The host Cleveland Browns had won their first three games under first-year Head Coach Sam Rutigliano, but lost a close contest to the Steelers the previous week thanks to a flea-flicker pass in overtime after an apparent Pittsburgh fumble had been blown dead. They were without HB Greg Pruitt, who had a calf injury, although FB Mike Pruitt (no relation) was healthy. QB Brian Sipe was showing improvement and had capable receivers in WRs Reggie Rucker and Dave Logan plus rookie TE Ozzie Newsome. There was talent in the defensive backfield, but the pass rush was lacking. It was an overcast day at Municipal Stadium with 72,776 fans in attendance. The Oilers took the opening kickoff and drove into Cleveland territory. 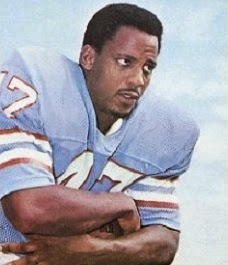 HB Ronnie Coleman (pictured above), starting in place of Campbell, carried four times for 15 yards and caught a pass for another seven, but when the drive was held up at the Cleveland 33, an attempt to convert a fourth-and-one situation failed when Dan Pastorini was stopped for no gain. The Browns advanced 43 yards in nine plays, helped by a pass interference penalty in a third-and-10 situation. Brian Sipe converted another third-and-10 play with a pass to Reggie Rucker for 18 yards to the Houston 26, but the drive finally stalled and Don Cockroft kicked a 41-yard field goal. The Oilers put together a long series. Pastorini completed three passes and Coleman and FB Tim Wilson ran effectively, but after getting a first-and-goal at the seven, the drive came to a halt at the one. On the first play of the second quarter, Pastorini once again tried to convert a fourth down, and once again was stopped short when tackled by LB Charlie Hall before he could reach the goal line. Cleveland managed to get out to the 14 before punting and Coleman’s 17-yard return gave Houston good field position at the Browns’ 41. With Coleman and Wilson carrying the load and Pastorini throwing to WR Mike Renfro for eight yards to convert a third-and-four play, the Oilers again moved into scoring territory, but Coleman fumbled at the 15 and DE Mack Mitchell recovered for the Browns. 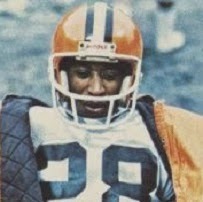 The teams traded punts until, with 1:40 remaining in the half, CB Clarence Scott intercepted a Pastorini pass to give the Browns the ball at the Houston 42. They scored in seven plays, four of them Sipe pass completions. The last two were to Dave Logan, for a 21-yard gain followed by a seven-yard touchdown. Cockroft added the extra point and the home team took a 10-0 lead into halftime. The Browns went three-and-out to start the third quarter but got the ball back when Coleman fumbled again and CB Ron Bolton recovered. However, four plays later the Oilers benefited from a turnover when CB Willie Alexander intercepted a Sipe pass at midfield. Pastorini converted a third down with an 18-yard completion to Renfro and, two plays later, connected with WR Rich Caster for a 41-yard TD. Toni Fritsch’s extra point attempt was blocked, but the Oilers were on the board and behind now by 10-6. The teams again traded punts, with Houston winning the battle for field position. A kick that pinned the Browns back at their two led to a punt that gave the Oilers the ball at the Cleveland 43, and in a series that extended into the fourth quarter, they went 43 yards in eight plays. FB Rob Carpenter ran for the last seven and a touchdown, and this time Fritsch successfully converted to give the visitors a three-point lead. Neither team was able to move the ball and punted following a possession apiece. They then traded turnovers, with FS Mike Reinfeldt intercepting a Sipe pass and Hall recovering a Coleman fumble at the Houston 24, and that led to Cockroft booting a 40-yard field goal that tied the score at 13-13. There were just over six minutes remaining as the Oilers started their next series, and they were forced to punt. Cleveland took over at its 30 but, four plays later and with 1:24 left on the clock, Mike Pruitt fumbled and LB Art Stringer recovered for Houston at the Browns’ 48. Pastorini immediately went long to WR Ken Burrough, who out-wrestled Bolton for a 44-yard gain. To the Browns and their fans, it appeared that Bolton had been the winner in the battle for the ball and that it should have been ruled an interception. Cans and bottles came flying out of the east stands, delaying play and finally causing the officials to shift to the other end of the field. Three running plays were followed by a Fritsch field goal from 19 yards. A last-gasp pass by Sipe was intercepted and the Oilers won by a final score of 16-13. The yardage totals were low, reflecting the defensive nature of the game, with Houston gaining the most (215 to 104) and also accumulating the most first downs (20 to 11). Even without Earl Campbell, the Oilers rushed for 164 yards, to just 78 for Cleveland. Each team turned the ball over four times. Dan Pastorini completed 14 of 29 passes for 215 yards and a touchdown as well as an interception. Tim Wilson led the ground game with 72 yards on 16 carries and Ronnie Coleman contributed 63 yards on 19 attempts to go along with his team-high four catches, good for another 63 yards. With the controversial late-game catch, Ken Burrough (pictured at left) had 68 yards on three pass receptions. For the Browns, Brian Sipe was successful on just 12 of 32 throws for 106 yards and a TD, giving up three interceptions. 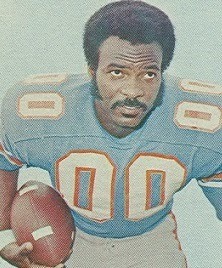 Reggie Rucker topped the club with three catches for 48 yards. Mike Pruitt ran for 41 yards on 11 attempts. The Oilers, with Earl Campbell back in action, lost at Oakland the following week but then won seven of their last ten games to finish at 10-6 and second in the AFC Central. Qualifying for a Wild Card playoff spot, they advanced to the AFC Championship game before succumbing to the Steelers. Cleveland won the next game but was successful only sporadically thereafter, ending up third in the division at 8-8. For Ronnie Coleman, once a starting halfback for the Oilers but now relegated to backup duty when Campbell was playing, the rushing total against the Browns was his highest output of the season as he gained 188 yards on 61 carries (3.1 avg.) and caught 19 passes for 246 yards.